This Creamy Roasted Pumpkin, Sweet Potato and Carrot Soup is easy, comforting and full of flavour. Perfect for warming the whole family through winter. 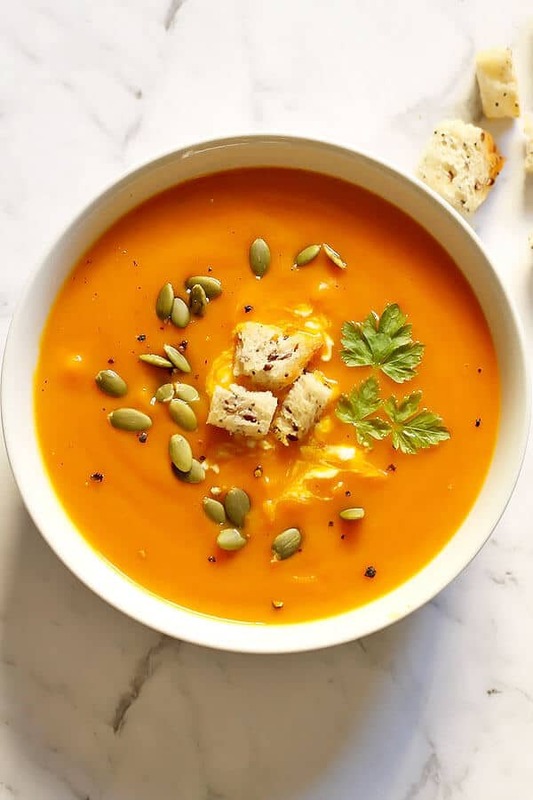 Friends, meet my favourite pumpkin soup recipe – my Roasted Pumpkin, Sweet Potato and Carrot Soup. It’s creamy without any cream (magic). It’s filled with good-for-you ingredients. And thanks to the roasted vegetables, it’s full of flavour. Sure, one-pot recipes are nice and all, but taking the extra step to throw the veggies in the oven for 30 minutes before pulling this soup together gives it more depth and flavour. The result – a deliciously sweet soup that the whole family will love. Serve as is, or with a dollop of greek yoghurt, some crunchy croutons or pepitas on top. Feel free to go ahead and make a batch for meal prep. This soup freezes extremely well, making it perfect for portioning out for work lunches or quick weeknight dinners. Olive Oil – OR you can use coconut oil if you’d prefer. Chicken Stock – OR you can use Vegetable Stock if you’d prefer. 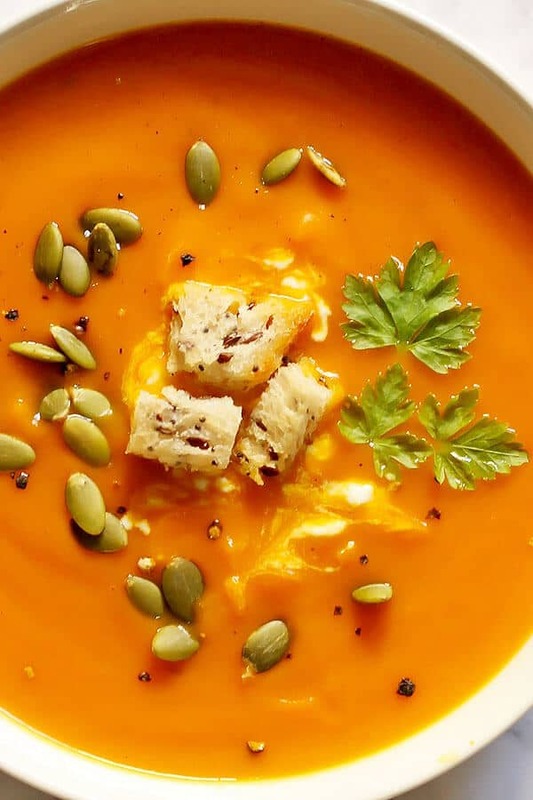 What’s the best pumpkin to use for soup? 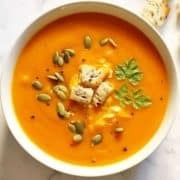 I love to use Butternut Pumpkin / Butternut Squash in this recipe but you can use any pumpkin you want. In Australia, Jap, Kent or Queensland Blue would all work well. In the US, sugar or pie pumpkins would also work. You can even use canned pumpkin if you wish. Store any leftovers in the fridge in an airtight container for up to 4 days. This soup freezes really well and is ideal for meal prep. Keep in an airtight container in the freezer for up to 3 months. 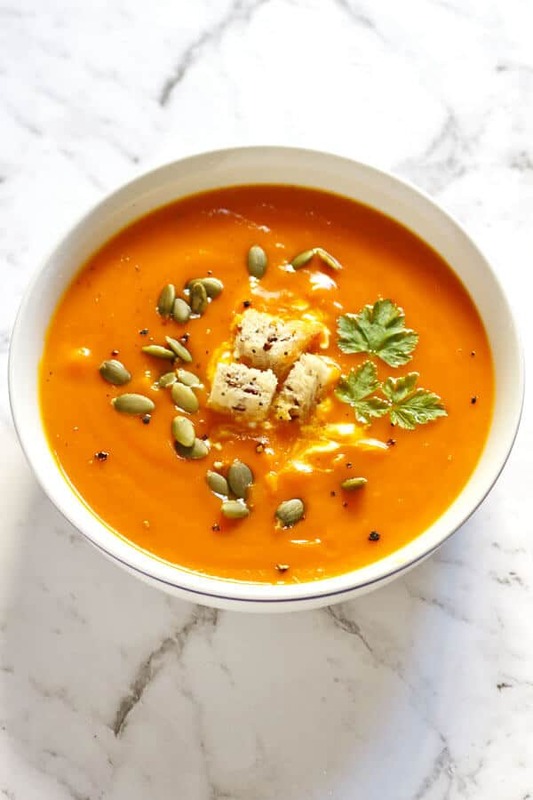 If you’ve tried this Roasted Pumpkin, Sweet Potato and Carrot Soup I’d love to hear how you enjoyed it! Pop a comment and a star rating below! You can also FOLLOW ME on FACEBOOK, INSTAGRAM and PINTEREST to keep up to date with more delicious recipes. Set the oven to 200C / 390F and line a baking tray with baking / parchment paper. Place pumpkin, sweet potato, carrot and onion pieces on the tray. Coat with oil and use your hands to toss around to ensure each piece is adequately covered. Sprinkle thyme across the top of the vegetables. Bake for 30 – 40 minutes, until the vegetables are browned and soft. 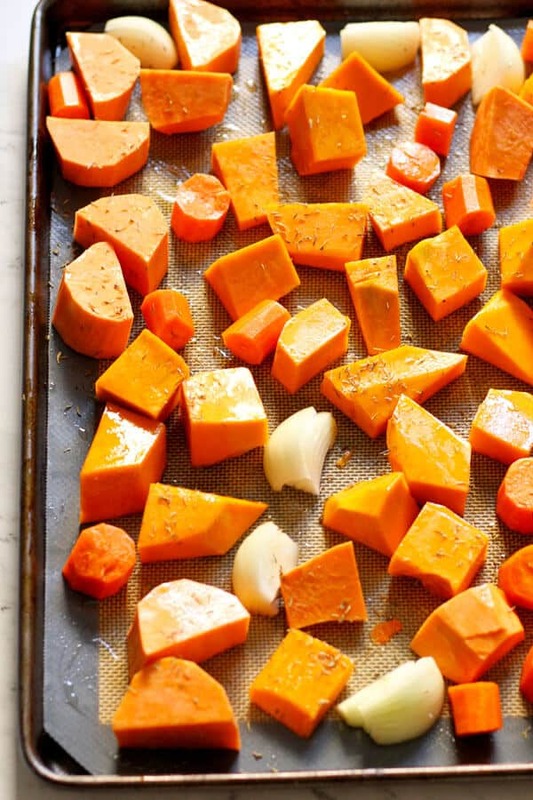 Transfer roasted vegetables to a large pot, pour in half the stock and sprinkle in cumin. Puree with an immersion blender until smooth. If the soup is too thick, add more stock as needed until desired consistency is reached. Place the pot on the stove and cook on medium heat for 5-10 minutes, stirring regularly. Serve immediately with desired garnishes. Pumpkin - Use any pumpkin you prefer. Butternut pumpkin / squash is my favourite, but feel free to sub for Jap, Kent, Queensland Blue in Australia, or Sugar or Pie Pumpkin in the US. You can also use canned pumpkin. To make vegan - Use vegetable stock. Storing - Soup will keep in an airtight container in the fridge for 4 days or in the freezer for 3 months. Updates - First Published January 8, 2017. Last Updated February 18, 2019 with more photos and tips. No changes to the recipe. Nutrition - Nutrition information is a rough estimate based on one serve. I just say yum, Thanks for sharing…. I recently made this for dinner and it was delicious. Thank you for the yummy recipe, we will be making again. This is my FAVOURITE soup – we make it so many times throughout winter and I love that it makes a few serves so you have leftovers for those nights you just can’t be bothered cooking! I’m making this tonight… will let you know how I go!! Pumpkin soup is one of my favorites Cassie. I add grated ginger, 3green apples and macadamia nuts to mine… Deeeelishious!!! Never in a million years would have thought to put any of those things in but I’m willing to give it a shot! I’ll just come over to your house for a bowl!